Treading the lines between journalist and academic, travel writer and scholar, author Tim Hannigan talks about his latest book and his unorthodox approach to writing historical narratives. Have you declared your major? The modern education system is designed as a series of separate disciplines of study. The result is a series of departments that can become, over time, ossified into silos. On campus, this is literature, this is journalism, this is history, this is engineering, and degrees are awarded based on demonstration of mastery of specialization. 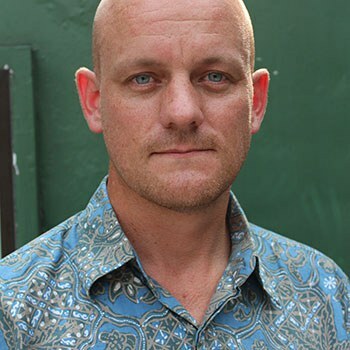 Award-winning author Tim Hannigan can be considered an outsider to the academic tradition. A surfer-bum-dropout from Penzance who came late in life to professional research and writing, his books are charmingly free of pre-conceived notions of specialization. They entertain readers while offering sharp insights into Asian history. 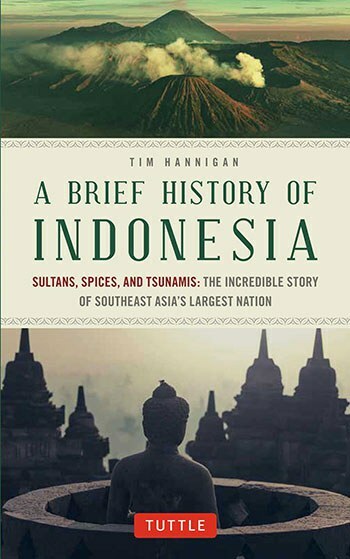 I caught up with Hannigan while he was in Jakarta recently promoting his latest book, A Brief History of Indonesia. Over afternoon coffees, we had a conversation about his approach to writing, his sense of tradition, and the next direction of his wandering muse. What first drew you to writing about the history of other cultures? I was a fanatical reader from a very young age, and was always scribbling away on stories of my own, so I think I've always had a natural inclination towards writing. When I was in my late teens and early 20s I had a vague aspiration, like many people, to become some sort of novelist. But I eventually realised that I was actually much more interested in writing about reality, be that the reality of the present day, or that of that past. Also, I do come from a long line of journalists. My great-grandfather was a newspaper editor in Scotland, and my father was a local journalist, and then a guidebook writer, though like me he didn't have an entirely conventional journey into the trade. He was a fisherman when I was a child, and only became a professional journalist after leaving the sea. It's in the blood. I had no particular inclination to continue my studies when I finished school. I just wanted to read, surf, and travel. There was always a sense of wanderlust, and as soon as I started travelling in my late teens I found myself consumed by this urge to find out more about the places and peoples I was seeing. I ended up training as a chef, and for several years I worked in kitchens during the summers, and then spent all the money I’d earned on winters travelling in Asia and the Middle East. When did you first visit Indonesia? I first came to Indonesia just after the 2002 Bali Bomb, arriving in a damp and desolate Kuta with a friend, another young Cornish surfer. We had three months to spare, precious little cash, and a hankering for a mix of good waves and dryland adventures. We ended up riding some pretty rickety ferries through the nether regions of Nusa Tenggara on a trip that culminated with a totally unplanned visit to the Pasola festival in Sumba, a wild ritual battle on horseback that takes place each wet season. There were no other tourists there that year; one of the warriors was fatally wounded, and the ritual spilled over into a violent clash between the participants and the local police. It wasn't exactly a conventional first taste of Indonesia, but needless to say, it got me hooked. I was back the next year, and the year after that, and then I came to live in Java. Is that when you first became interested in Indonesian history? It was on that first trip through Nusa Tenggara that I first became intrigued by Indonesian cultures and histories. It was also on that trip that I first became frustrated by the lack of properly engaging, non-academic books about Indonesian history. From that point onwards I read as much as I could about the place, much of which was, for lack of anything else, serious scholarly work. How would you say your background as a journalist has affected your research and writing of history? Do you see a distinction between your mode of writing and more academic modes of research and writing? I don't ever think of myself as a historian: I'm a history writer. I always try to come at the past with the intention of telling a story, of forging a narrative, which is also what a journalist has to do when reporting the events of the present. I want to inform people, and sometimes to make a serious and original argument, but my first task is to engage and entertain, and that’s the fundamental difference between my sort of pop history writing, and more scholarly work. My previous books, Murder in the Hindu Kush: George Hayward and the Great Game (2011) and Raffles and the British Invasion of Java (2012), were very much founded in primary research. I read the surrounding literature, and then I spent a long time in the archives, sifting through original manuscripts and letters, just as an academic researcher might do. But I always had my eye out for the little flashes of colour, the gossip, the incident – a reference to someone getting drunk, falling off a horse, having a fight, anything that could be used to create a dramatic or amusing passage in the finished book. So the research process itself may often be quite similar for an academic historian and a narrative history writer. It's the intent that differs: you're looking for different things. Storytelling is a key feature of your books. They are non-fiction in the best sense in that they revive true historical events using the tropes and techniques of fiction to compel the reader. Are there fiction writers that you feel influenced your work? For me narrative non-fiction in general – not just history writing, but also travel literature, biography, reportage and memoir – absolutely has to draw on the tropes and techniques of fiction; that’s what defines it, really. The first narrative history books I ever read, at the age of 18, were John Keay's The Gilgit Game: Explorers of the Western Himalayas (1994), about the "Great Game" in 19th-century Central Asia. They introduced me to that topic, which I eventually went on to write about myself. More importantly, they introduced me to the whole idea of narrative history writing. "Creative non-fiction" is actually a fairly recent concept, and quite radical, really, when you look at the non-fiction writing of the past, which tended to be much more formal. It uses character, tension, dramatic structures, and in some cases even dialogue, all of which are elements originating in fiction. I think it's tremendously exciting. When you go through the big thick academic tomes, how do you pick out which stories will be engaging and fun yet revealing for the reader? It's really a case of having that journalistic nose and remembering that whole time that what you're doing is telling a story and really try to keep as focused on that as possible. Sometimes it's hard. With the Raffles book, the first draft was over 200,000 words long, including a big discourse on Orientalism. You just have to keep remembering that when you go off on those tangents, your primary purpose isn't to present findings: my primary purpose is to entertain readers. A great example is the fact that when the British landed in Java for the invasion, the first person out of the boat was John Leyden the poet dressed as a pirate in fancy dress. I found the reference for that in the British library and it was just one of those moments. I was in the big reading room where they hold all the old India office records, I was kinda flicking through and there it was in front of me! And I look around thinking "Oh my God! This is just amazing!" If you're an academic researcher, that would be of slight relevance. It would be a footnote; whereas for me, it's amusing for the reader but also a revealing insight into the history of the moment. The Raffles book caused quiet a stir. Do you consider yourself a sort of myth-buster when it comes to iconic historical figures? Well, I do have a tendency to disrespect totems. There's almost a kind of punk sensibility. Well, there is. I come from the depths of Cornwall. I was born in Penzance and I grew up in a tiny hamlet on the edge of the Atlantic. I've wandered around a good deal, but that's the only place I've ever really thought of as "home". Cornwall is a really unusual place in Britain in that it is one of the few places where class isn't really a thing, and I genuinely did not know that class still existed in the UK until I went to university at the age of 24. Gloucestershire, in Cheltenham, which is very, very class. It's where all the ex-servants of the East India Company used to go home to retire, and it still has this really posh… it's where Cheltenham Ladies' College and all these posh schools are… but it also has a very kind of rough side, as well. It was only when I went to university that I discovered that actually were people who define life by what school you went to and that kind of thing, and that's a huge thing in the UK, but growing up I had no kind of sense of that. Cornwall has local people and then it has all these people who drifted in. There were a whole bunch of these guys who turned up in the '60s and married local people, like my own parents, so you have this real mish-mash of like farmer's daughters married to some guy who ran away from a rich family in London to be an artist, so I think coming from that I have no sense of boundaries and no sense of having to respect certain things. So you don't set out to smash the icons? I don't deliberately set out to destroy icons, but if it happens in the process of telling the truth, then it's always good fun and I'm quite happy about it. The Raffles book had no intention originally of that being a book about Sir Stamford Raffles. I set out to write a book about Java, and I think that's actually really key to the way the book turned out. All the other popular books about Raffles were written by who people set out to write a book about Raffles. 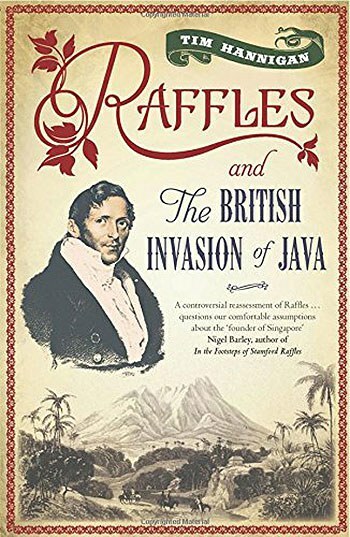 So they came to Java, in a research sense, through the context of Raffles. I came to Raffles through the context of Java. We have this idea of the noble man. But in the manuscripts I found Raffles talking about smashing and crushing the Javanese and breaking them and all this kind of thing, and you find these bits where he's sending kidnapped prostitutes to Banjarmasin [in Kalimantan], you think… you don't come at it cleanly… you don't come at it objectively… you come at it and think, "this is kinda out of characte.." But if there's a litany of things that are "out of character" then they begin to define the character. I thought, "Bloody hell! There's the story here …this is not the Raffles that people know!" And that's where the book comes from. This is really a kind of investigative journalism. I'm a journalist so my inclination is to tell the truth and find the interesting stuff. I've always had an issue with constructed narratives and constructed identities, so if somebody gives me what is obviously a received version of events or history, immediately I start to think, right, let's have a look, is there more to this? Let's try and tell it as it is without being wilfully revisionist for the sake of it. A classic one in Indonesia, is that the Majapahit Empire [1293 to around 1500] was the actual basis of modern Indonesia. The idea is that there was a precedent with a pan-Indonesian empire before the Dutch East Indies, which is really an over-simplification. The Raffles one got called 'controversial', which was good for book sales but I was a little bit kind of put out by that. Because you are smashing the idol. But only because I'm reporting what I came across! To me, misrepresenting the facts should be controversial, and most writers on Raffles do misrepresent the facts by downplaying or outright lying about things that are bad or unpleasant about him. That should be the controversy! Often you visit particular sites and then write about them to create a contemporary context for readers. How has your experience as a travel writer has impacted your history writing? I suppose you could say that I'm a travel writer first and foremost. Writing about place is what really captivates me, and the best travel writers – people like Colin Thubron and Patrick Leigh Fermor – make history a crucial element in their capturing of the essence of the lands they travel through. When I started work on my first book, Murder in the Hindu Kush, I was certainly deeply interested in the central figure, an ill-fated Victorian explorer called George Hayward. But if I'm honest, it was probably the fact that his story would give me an excuse to write about the wild landscapes of Kashmir and northern Pakistan that excited me most. To some extent that's probably true of my books about Indonesia, too. But travel writing and history writing make a magnificent partnership anyway. Without a sense of the physical setting, history is very dry, and without a sense of the historical contexts a description of place is somehow empty. So why Thubron and Leigh Fermor, specifically? What do you think you're taking from them? Really my core reading material, and what I would aspire to, is travel writing, English travel writing. What I admire about Thubron, is his meticulous and beautiful prose. What I also very much admire is his ability to draw in history into that, which Patrick Leigh Fermor did as well but with a more creative style, but what is absolutely key is Thubron's respect for truth. Patrick Leigh Fermor notoriously made-up enormous chunks of his Time of Gifts (1977) book, Bruce Chatwin, who I adore as a stylist, is one of the most problematic writers of all time, simply making things up, whereas Thubron has a deep respect for what actually happened. He's been quoted as saying something like 'if you have to make things up, then it obviously wasn't a very interesting journey.' And he takes a very precise approach. He learns languages properly, he studies in-depth. His first book, Mirror to Damascus (1967), is about the city in the '60s but is also very rooted in history. I really like his blending of place writing and travelogue with an element of first person narrative. However, my model, really, as a Western writer writing about Asia is William Dalrymple. He was a travel writer who wrote books with a historical theme, then moved into writing narrative history, but again with a deep sense of place. What I particularly admire about him, is that he knows his contexts intimately, especially India, but when he writes, he privileges local perspectives as much as Western perspectives. He is very much aware of the colonial heritage that he carries, but he isn't in any way crippled by it. He has a rare ability to be unreservedly critical of European imperialism without being hobbled by postcolonial guilt. He's also really very self-consciously -- some might say slightly archly -- a member of the English travel writing tradition, so stylistically and tonally he references his predecessors; and I like the fact that in his travel writing, he's very obviously and consciously being part of the tradition, which, is, to some extent, my tradition, as well. People like Thubron and Dalrymple are, in the literary world at least, as close to celebrities as you can get. I mean, not only are their books reviewed in The New York Review of Books, they write for The New York Review of Books. That's about the top of the pile. So is it your goal to reach that sort of height in your own writing? It would be nice, but in actual fact, I'm quite happy writing fairly obscure books about Indonesia and Asia generally. I do have an agent in the UK and when I wrote the proposal for the Raffles book, as soon as my agent saw it, he said "Who's Raffles and where's Indonesia?" but I didn't really care because I want to write what interests me, not just what will sell. You say in the preface of your new book, A Brief History of Indonesia, that you're writing this because there's nothing else like it—a compact, entertaining history of Indonesia for casual readers, as opposed to academic specialists. Why do think no one has done this before? I honestly do not know. When I first arrived 13 years ago I was looking for one, and then I waited for one, and kept waiting, so I just figured, well I better do it myself. It's possibly because big international publishers aren't interested, the other thing is, Indonesian specialists are academic and there's a really strong academic field for Indonesia. But they're a closed house. They tend to write for themselves, and tend to be highly specialist stuff that even well informed travellers and readers will find daunting. It's not their intention to write pop history. So who's the book for? Who is your intended audience? My first intention was that it was to be me. A 22-year old me, when I first arrived: an interested backpacker who liked reading history. From a publishing angle, it's for newly arrived ex-pats or people who have picked up some international news buzz about Indonesia and would like to know a bit more. But an interesting thing that has come up is its probably going to be as much for Indonesians, if not more so. Indonesians have been really excited about it. And there is no such book in Indonesian, either. There are many history books, but they tend to be specialized, or academic, or hugely expensive, big coffee table type things. So the response from Indonesians has been really excited, which is great! Did you come at the new book with a structure already in mind? From the outset I was aware that histories of Indonesia tend to be Java-centric, and I knew that this would be Java-centric to a degree, but I struggled to keep it as a national narrative. With early history, it's easier to include Sumatra and the other islands, but once you get to Indonesia as a distinct national entity [in the mid-20th century], it becomes Java-centric by default. So there's less from the peripheries than I'd like there to be, and individual characters have been cut out. There are a number of colorful, engaging characters that there simply wasn't space for. It all had to be squeezed, which was an interesting exercise. It's the shortest book I've ever written, but it was the hardest book to write, and it hurt a lot more to write this than my previous books. From starting to finishing the first draft was only a year, then just shy of another year of to'ing-and-fro'ing until it went to press. But behind that is ten years of background reading and travelling in Indonesia, so it was written in a fairly short period of time, but the background reading I had done was already there on my shelves, so you couldn't have started from zero and written it in a year. Finally, what projects are on the horizon for you? There are always many, many projects bubbling around in the back of my mind, background reading stacked on my desk, and ideas scribbled in my notebooks. The problem is finding time to do them justice. History writing is a time-consuming business. I actually write very quickly; it's the research that takes forever. There are a couple of other episodes of incongruous British involvement in Indonesia that I'd like to tackle at some point soon. But before that there's a tale from British Malaya that I have my eye on. It's got adventure, romance, heartbreak and betrayal – all the stuff of a good novel – plus geopolitics, war, Western attitudes to "primitive peoples". and imperialism in its dying days. It looks like it's got everything a good piece of narrative history needs.